Growing up in Culpeper, Virginia, I was always interested in hair, fashion and anything creative! After studying Business and Hospitality in college, I returned home and started my career as a Designer. When I moved to Richmond, my real estate agent was a Mango client and recommended I check it out. Now I'm here, and having a blast helping guests create their everyday style. BIT ABOUT ME I'm a kid at heart and love to be active! My favorite product is Aveda Men Pure-Formance Shave Cream. It is great for shaving your face and head---without razor burn or bumps. Gave me great cut and enjoyed his conversation. Recommend him very highly. Great visit! Super cordial and asked lots of questions as it was my first time there. Stacey is amazing! He cuts my hair perfectly. I come in feeling disheveled and leave feeling beautiful. 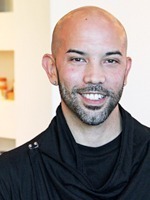 He really knows how to handle textured hair and keeps the clients wants and needs in mind. Love him! As always, exceptional service. Great cut. First rate haircut and excellent customer service. Stacey is delightful! He always listens to what I need and then provides a cut that not only makes me feel beautiful but fits my lifestyle. The atmosphere at Mango Green Gate is welcoming, cheerful and relaxing. I’m a fan! Very personable. He listens to what you would like and he suggests what could work too. Really enjoy coming to your salon and having Stacey cut my hair. You’re very lucky to have him on your team. Thank you Stacey! Professional and pleasant. Excellent cut! I am more than 100% pleased with the color used today. Already made my next-6 weeks appointment. Thank You, Stacey. See you in 6 was. Stacey is great to communicated his creative mind and quick to understand my own personal taste to achieve a perfect result. Stacey is the best. Always delivers a great haircut and conversation. I always enjoy my time with him and leave looking fresh! Excellent! Stacy does great job - courteous friendly and professional! I recommend him to all my friends! Stacey does a great job with my highlights, helping me to cover the grey in a way that is age appropriate. Stacey is terrific. Very happy with my haircut. Enjoyed the visit.Stacey was the best. Very personable and did what I wanted. Stacey is awesome as usual and my hair looks fabulous! Stacey has given me the best cut that I have had in decades. My thinning hair looks great and full. Most of all, I feel pretty. Stacey was very friendly and he is a very talented stylist. Love how my hair turned out! Everything. Lovely, unhurried and the warm towel after shampoo and hand massage are such a treat. Never had that at any salon in any of the cities I've lived in. everything was done well....a relaxing time there. No rush, calm and a head and hand massage icing on the cake. Perfect environment. Stacey is thoughtful and listens well delivering not only a great color and cut but what I wanted. Everyone so cordial and nice. No wait. I gave Stacey very little direction outside of cutting off 8 inches. I am pleased with what he decided to do, and have received so many compliments! Stacey was great at listening to my thoughts and interests. I enjoyed getting to know him. He was gregarious and provided a wonderful experience for me at Mango. He listened to me and cut my hair as requested! Stacey listens and is kind. He has great technique. Easy and friendly. Smart. Listened and discussed what I wanted. I really got a great cut. Stacey was awesome! He answered all my questions and did exactly what I had in mind! Keep him around!! Stacey was so amazing and did not pressure me into buying expensive products at the end which I really appreciated. Excellent color and highlights - exactly what I was hoping for! He really listens to what his clients ask for and then delivers. Very happy! Stacey was very professional and helpful. He did an amazing job with my color. Talked directly to children v over their head to adult. Listened to them. Stacey made me feel comfortable and truly listened to me. He explained thoroughly what he thought would work. Stacey was very attentive and he did a wonderful job making sure he understood what I wanted done to my hair when I was initially nervous. Kept conversation going while cutting.